This protective line of bollards protects accessible pedestrian space from the road. Bollards are needed in all sorts of places where the ground is not level. In some cases, they’re used in conjunction with ramps or other access-friendly elements. In others, they’re installed to help mediate a steep grade or turn, where the risk of accident increases. To install properly on these sorts of surfaces, care must be taken. Bollards installed at an angle, not plumb to the ground, are at a structural disadvantage. Internal mounting systems are based on a rod that runs through the bollard’s center. This rod will be under strain if it’s not plumb. Leaning or crooked bollards also look unsafe or sloppy, and can make a site look unkempt or uncared for. Bollards are regularly installed for traffic guidance. A line of straight bollards provides a clear marker of a path, and running parallel to a traffic lane, creates the illusion of a wall. Bollards that jut out of line make that line less clear to a driver’s quick glance, making them less effective as communication tools. In order to install plumb bollards onto uneven surfaces, contractors should follow a few simple steps. These are appropriate for bolt-down, adhesive, or concrete-anchored applications. These bollards cover security pipe: they were specified during the design and pour of the ramp. Pouring new concrete for a bollard installation is one very simple way to make sure that the stands at a true vertical. Using a trowel, a concrete footing can be shaped to match the base diameter of the bollard. The high and low sides of the bollard footprint can be levelled. Depending on the application, a slight bevel can be added to the low-side slope gently transitioning from the footing to the grade. Or, the low-side can be shaped like a sharp step, with the bollard bolted or anchored to the top. For internally mounted bollards, concrete anchors can be properly set and leveled during the new pour. For adhesive anchors or bolt down plates, bolt holes can be made after the concrete is cured. Concrete takes different times to set, depending on the type of concrete used, and on environmental conditions like humidity and temperature. Three days is common, but cement can cure for up to seven days. Concrete continues to harden after the initial curing. A level concrete footing can also be created by cutting a hole in existing sloped concrete, leveling, and pouring a new level slab into that space. This can be done to the exact diameter of the bollard or be poured in a simple square slightly larger than the bollard base. High-side grinding levels the bollards: the lamp-pole is a custom pored slab cut into the sidewalk. Pouring new concrete may not be necessary. On existing hardscape, grinding or flattening of the surface on the higher side of the bollard is also one way to level a slope. With a small slope, this grinding may be enough to ensure the bollard’s footing is level. Although this sounds like a simple procedure, the expertise and skill of an experienced professional is worth its weight in gold. Bringing the high side level to the low side, but not below, prevents standing water from accumulating and ensures proper drainage. Grinding to fit the bollard diameter also keeps the ground safe by ensuring there’s no gap. Too-wide gaps could catch a shoe heel or visual-assistance cane and therefore be a tripping hazard. Wedges are generally used for greater slopes, and shims, which are flat, stacked for smaller grades. If the slope is steep enough, it may be either physically impossible or visually unappealing to level the bollard simply by grinding the high side down. A steep hill might change elevation by several inches over the base of the bollard. In this situation, grinding might end up burying the high-side of the bollard too far up the base. In these situations, shims or wedges can raise bollard on the low side. Plastic is often preferred for bollard shims. Steel shims and wedges are available, but in outdoor situations with water ingress, are more likely to rust. Galvanized or stainless steel wedges or shims are also sometimes used, depending on the application, if they are properly sized for the job. The benefit to galvanized and stainless steel is their increased protection against rusting. However, in applications with a lot of salt or de-icing, they may not be ideal. One of the benefits of plastic shims is that they are relatively easy to trim. If your shims stick out from the edge of the bollard, trimming them to fit under the bollard allows them to be embedded in grouting around the low-side. This hides them from view and makes sure they’re not a tripping hazard. The bollard footings were piped in and manually formed to be the exact diameter of the bollards, to keep as much tactile paving for visually impaired pedestrians as possible. To finish a bollard install on sloping ground, non-shrink grout is often piped in around the low side. This grout seals any space under the bollard edge. If there is a shim involved, it cements it in place and hides it from sight. The non-shrink grout provides stability to the bollard and prevents debris from accumulating in the internal cavity. No-shrink grout is a hydraulic cement grout with compounds in its mix to prevent it from shrinking as it dries. There are non-metallic and metallic non-shrink grouts. Non-metallic non-shrink grout is often used for these installations; where metallic grout is used in security installations, generally it is an aluminum-based grout to prevent staining due to oxides. Sloped surfaces allow for water run-off. In areas dealing with a lot of moisture, a small amount of draft is left on the down-side to allow for run off efficiency. An affixed bollard is not water tight, so water seeps through channels in the concrete underneath the bollard. 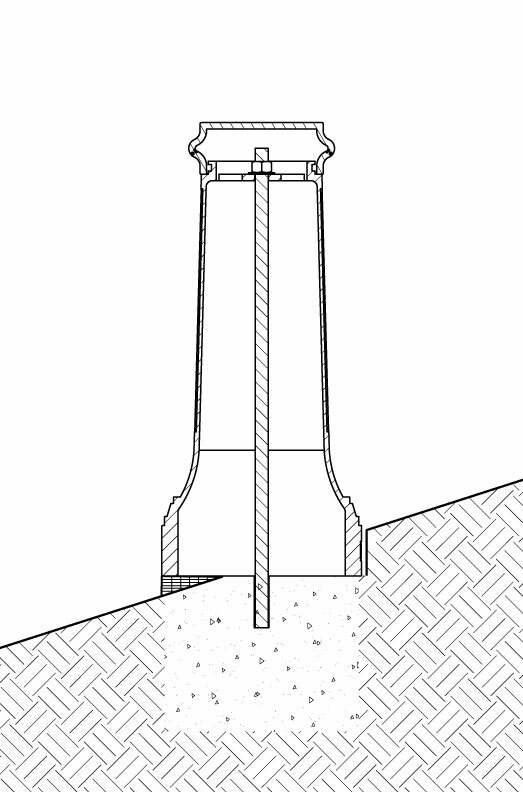 In many climates, the hollow space inside the post experiences the chimney effect. Condensation forms inside the bollard and can lead to rusting of the iron surfaces. Over time, this rust turns into a thick protective patina, like the one often observed on sewer grates, trench grates, and tree grates. Before this patina builds, condensation run-off can lead to the weeping of rust onto the ground around the bollard. This is usually temporary. Bollards are often useful in situations where there is a purposeful grade, like ramps or along run-off graded sides of pathways. As delimiters of an edge, they often transition between two different surfaces. Installing bollards along the plumb line is important for the little posts to do their job well. An upright bollard is an attractive addition, whereas bollards just slightly off center distract the eye. Further, bollards installed squarely look more solid and reliable. They communicate the edge of an area with precision. Fortunately, getting bollards installed well on uneven surfaces is not as challenging as other types of uneven-ground building. Each bollard has such a small footprint to level. Done well, bollards will remain upright guards—unless they’re run into or purposefully moved.